Beaver Street's name honors New Amsterdam's first major export, whose trade was once centered on its blocks. Entrepreneurs like John Jacob Astor were so successful in providing beaver pelts for the hat industry that the animal was nearly wiped out in the state; they've been making a comeback, though, with one individual recently spotted in the Bronx River. Since 1975, the beaver has been the New York state animal, and is also featured on the city seal. By 1733 this spot had been dedicated to the ''Beauty & Ornament'' of Broadway and the ''Recreation & delight of the inhabitants''-- recreation in those days often involving lawn bowling (ala Rip van Winkle). In 1765 the colonial governor was burned in effigy here in protest of the Stamp Act. 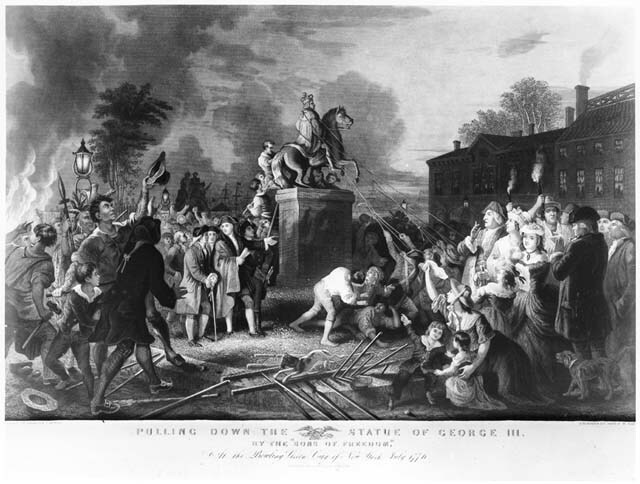 In 1770, a statue of George III was erected here to thank him for repealing that act-- only to be torn down (and melted down into Revolutionary musket balls) on July 9, 1776, in celebration of the Declaration of Independence. The present fence dates from that era, and is still missing the decorative crowns that were snapped off by the anti-royalists. The first modern elephant in North America was exhibited near this intersection on April 29, 1796. Block (2 Broadway): This building was designed in 1958 by Emery Roth & Sons, the WTC architects, and reskinned in 1999 by the modernists Skidmore, Owings & Merrill. It replaced George Post's 1882 Produce Exchange, a huge red Romanesque structure that ''was one of the city's greatest architectural losses'' (AIA Guide). Block (26 Broadway): Starting in 1886, this was the headquarters of the Standard Oil Trust during the height of its power; John D. Rockefeller had his offices here, as did his partner Charles Pratt, founder of the Pratt Institute. When Standard Oil was broken up in 1911, this became the headquarters of Socony, later Mobil, which greatly expanded the building in the 1920s before moving to 42nd Street in 1956. (The expansion was begun by Carrere & Hastings, architects of the New York Public Library, and the tower added by Shreve, Lamb & Blake.) Upton Sinclair organized pickets here in 1914 in protest of the Ludlow Massacre. Today the building houses (among other things) the Museum of American Financial History, opened in 1988. 16 (corner): 16Beaver, "a space initiated/run by artists to create and maintain an ongoing platform for the presentation, production and discussion of a variety of artistic/cultural/economic/political projects." The building also houses the NYC Coalition Against Hunger. Corner (70 Broad): Originally the American Bank Note Company Headquarters, a 1908 neoclassical design by Kirby, Petit & Green, this was converted into a restaurant, Wall Street Kitchen & Bar, in 1996. 25 (block): Also known as 60 Broad Street, this 1961 Emery Roth building was the offices of Drexel Burnham Lambert, chaired by Michael Milken, known as the Junk Bond King. Milken went to jail for insider trading as Drexel became the symbol for the financial excesses of the 1980s. The building now houses state offices like the Division of Housing and Community Renewal, the state Insurance Division, and the Office of Court Administration. 21-23: New Amsterdam's first poorhouse was opened here in 1653. At this intersection on June 6, 1775, British troops leaving the city for Boston were stopped by New York militia officer Marinus Willett and forced to relinquish a cartload of guns. The British had been granted safe passage out of the city but were only allowed to retain their personal arms. The confiscated weapons were given to New York's first revolutionary army. Corner (67 Broad): The International Telephone and Telegraph Building, erected in 1928 by Garment District developer Abraham Lefcourt as the Lefcourt Exchange Building, was almost immediately bought by ITT--which expanded the building to take over the whole block by 1930. (Buchman & Kahn were the original architects; Louis S. Weeks did the addition.) The southwestern entrance has a mosaic dome that depicts Commerce uniting the hemispheres with electricity. 42: The John Heuss House, a drop-in center for the homeless and ill run by Trinity Church. 56 (corner): For almost a century, Delmonico's was the most prestigious restaurant in New York City. The Delmonico family opened a branch in this location in 1837, replacing their original restaurant that was destroyed in the great fire of 1835; the pillars out front were reportedly excavated from Pompeii. In 1891, the current eight-story structure was built to house the restaurants; the original Pompeiian pillars were retained. This branch closed in 1917, and the Delmonico's empire was extinct by 1923; the current restaurant borrows the name and the location, but otherwise has no connection to the original Delmonico's. Block (1 William): Originally built in 1907 as the J.W. Seligman & Co. Building, a rusticated Renaissance Revival design by Francis H. Kimball and Julian C. Levi. In 1928 it became the Lehman Brothers Building. Italy's largest bank, moving in 1982, added what the AIA Guide calls a "brilliant modernist addition." Corner (55 Broad): New York Information Technology Center is a 30-story office building with a number of high-tech tenants. Corner (3 Hanover Square): A 23-floor limestone building, built as the New York Cotton Exchange in the 1920s, was converted to a co-op in 1985. 66 (corner): Better known as 5 Hanover Square, this 25-story modernist office building went up in 1961. Captain William Kidd, New York City's most famous pirate, lived in a mansion near this corner, in New York's fashionable Hanover Square district, from 1691-95. 69 (block): Also known as 20 Exchange Place or 22 William Street, 57-story limestone tower went up in 1931, designed by Cross & Cross. Originally the City Bank Farmers' Trust Company, it later became the First National City Trust Company before being bought by the Canadian Imperial Bank of Commerce. 76 (corner): Known as 11 Hanover Square, this 1930 building rises 25 stories. The National Council for Research on Women is in this building; Cafe Bravo is on the ground floor. 80: Killarney Rose, an old-school Irish pub. 82 (corner): From 1939 until 1967, this was home to the Commodity Research Bureau. In the 1980s and '90s, the Spanish restaurant El Rincon de Espana was here--closed in 2002. In 1960, the Spanish restaurant El Patio, which orginally opened in 1850, moved to this location. Corner (63 Wall): The 1929 neoclassic headquarters of investment bankers Brown Brothers Harriman, designed by Aldridge & Dietrich, this 36-story building was converted into a fancy apartment building in 2004. The coins on the facade are ancient Greek drachmas. Corner (67 Wall): This 25-story triangular building, originally known as the Munson Building, was designed in 1906 by Kenneth M. Murchison for the Munson Steamship Company. From 1931 until 1972 it was the New York Cocoa Exchange. Converted to a co-op in 2003. Corner (80 Wall): Tontine House, a 13-story building by Clinton & Russell whose name commemorates the Tontine Coffee House, which became the first indoor meetingplace of the New York Stock Exchange. What am I missing on Beaver Street? Write to Jim Naureckas and tell him about it.